It’s that time of year. The weather is a tad cooler, the pumpkin craze is revving up, on weekends you’re donning your favorite football team glam, and you have the TV set on ESPN. Or maybe you’re loading up the car to head to the stadium and best of all, tailgate! 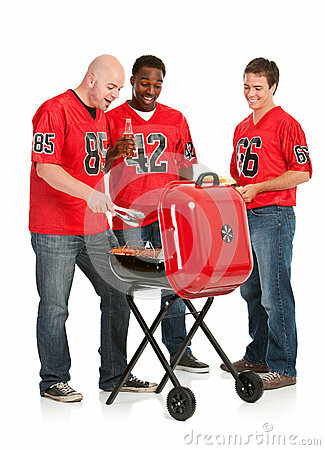 Even if you’re not the biggest football fan, it is hard to resist the mouth-watering aromas and treats of tailgating. It is true that game day food, while delicious, isn’t often the friendliest to our figures. It is also true, however, that it does not have to be that way! With a little planning, it is still possible to satisfy the taste buds and avoid the guilt after the game. Besides, who wants to feel so sluggish they can’t hoop and holler their support when their team scores? Chips and Dip – Always a game time favorite, but often fat and calorie-packed. Avoid this by opting for baked tortilla or pita chips and using dips such as guacamole, hummus, a low sodium salsa, or this yummy and healthier Chile con Queso recipe (so much less junk in it than buying store-bought too!). For more preservative-free dip recipes check out this post. Nuts – Get in some omega 3’s with a favorite game day snack. So easy to travel with, little mess, and no refrigeration needed. Get creative and jazz things up with trail mixes. If you looking for some great ideas in this category, check out some of Nuts.com registered dietitian’s top picks on their healthy snack page. Jerky – Another great low-calorie traveling snack with a boost of protein. Jerky-making has become quite a popular hobby if you happen to own a smoker. If you don’t, however, aim for getting homemade jerky from local meat markets, etc. as many commercial brand names have a lot of sodium and preservatives such as MSG. Chili – So nice to cozy up with hot chili during a cold-game day. The possibilities are endless: lean beef, turkey, or this delicious and highly reviewed White Bean Turkey Chili. Chili is typically low-carb and full of protein. There are TONS of healthy chili recipes out there based on your preferences. Soups/Stews – Again, so many recipes to choose from, and they can all be easily transported with the help of a thermos. They are pretty hard to beat on freezing game days too. Even better, choose soups and stews that have 400mg sodium or less, and are packed with nutrition from vegetables or legumes. Sliders – An icon of game-day food. You can get very creative here. Throw lean ground sirloin or turkey on the grill, or use BBQ chicken or slow-cooker pork loin. Use whole-wheat mini-buns and pile on the veggies. Lower-calorie cheeses to try include swiss or parmesan. Then, voilà! A satisfying mini-meal that with those slight tweaks, packs in more nutrition with fewer calories. If you want to get even fancier, check out my favorite pesto recipe to top them with. Beverages – With the wrong choices, high-calorie or sugary drinks can unfortunately sabotage your health efforts without you even realizing it. Fruit-infused waters or teas can help replace sodas. Although I’m personally not against having a beer on game-days, remember the Dietary Guidelines for Americans recommend no more than 1 drink a day for women, and no more than 2 a day for men. For more healthy ideas, check out my post on Game Day Eats. So many options. Have any great, nutritious recipes? Please feel free to share them!